Are You Spending Too Much To Advertise Your Business On Search Engines? At Lure Marketing we constantly see small errors that are costing small businesses big money. Even professionally managed campaigns are not immune. With that in mind we have compiled a list of the 8 most common mistakes that are made on small business SEM accounts. Google decides how much to charge you for your advertisements. Increasing your “Quality Score” decreases the amount you pay. You can improve your “Ad Rank” to gets your ads seen by more people, without increasing your budget. To use Analytics to see how much business your ads actually generate. You can avoid the 8 most common errors that cost small businesses thousands of dollars a year. 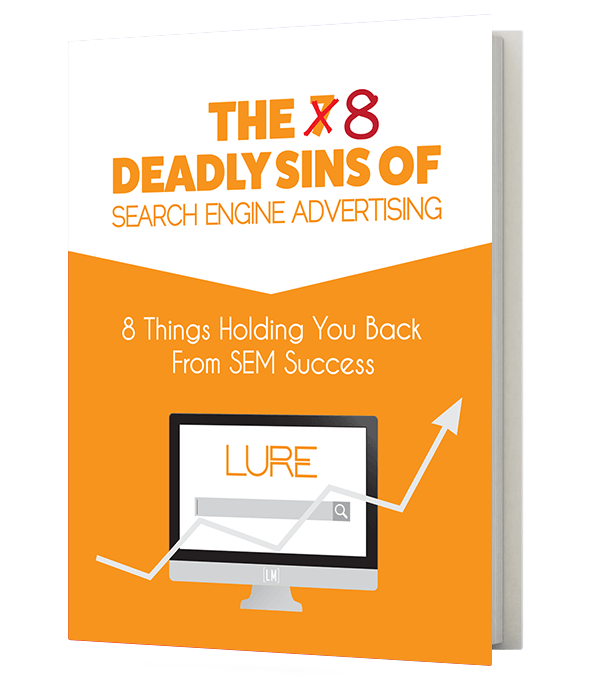 To get your free copy of The 8 Deadly Sins Of SEM simply fill out the form below. You will then be redirected to a page where you can view it. You will also be e-mailed a copy. Advertising on major search engines like Google offers many benefits to small business owners. It allows you to put your business in front of consumers interested in what you sell, at the exact moment they are searching for what you sell. Not only that, it allows your website to rank at the top of search results, even if it normally doesn’t rank well for that search. Search engine marketing (“SEM”) allows you to bid on specific words and phrases (referred to as "keywords") that you believe are profitable to your business. Consumers searching for these keywords are then able to see your ads and click through to your website. Search engine advertising is a form of “pay-per-click” or “PPC” advertising. This means you are only charged when a consumer clicks on your ad. The amount that you are charged (your “cost-per-click” or “CPC”) changes depending on a variety of factors. Unlike a traditional auction where the price you bid is the price you pay, in Adwords the price you bid is the maximum amount you are willing to pay. The final amount advertisers such as yourself are charged is based on your bid, the level of competition for the keyword being bid on and ad quality factors (the "Quality Score" of the ad). Google uses these ad quality factors to ensure that only the most relevant, engaging ads are shown to consumers. Ads with higher Quality Scores pay significantly less per click than ads with lower Quality Scores. Ads with higher Quality Scores also receive higher "Ad Rank”. This means that they will be placed higher in search engines results pages than other ads. The higher an ad is placed on the results page, the more people will see it and the more people will click it. Higher Ad Rank means more leads and sales for your business. With all of the potential that search engine advertising has, we still hear small business owners telling us that advertising on Google is too expensive or that they can't make money with it. Looking into their campaigns we see the same small mistakes that are costing them and many small business a ton of money; both in terms of increased cost-per-click and in terms of lost leads from low Ad Rank. With this in mind, we thought we would compile a list of the most common errors we see in small businesses’ search engine marketing campaigns. Here are the 8 deadly sins of SEM. Not sure if this guide is for you? Scroll through the tablet on the left to get a preview of the first few pages! Like what you see? Get your copy by clicking on the button below. Please note that we will send you e-mails related to this download. You can unsubscribe at any time.